A Jewish cemetery in Osoblaha belongs among the most precious monuments in the Czech Republic as well as in Moravskoslezský county. Currently the cemetery is in a good condition and it is freely accessible. 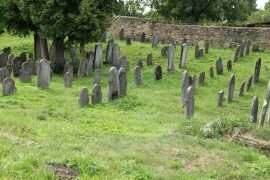 The cemetery comes from the 16th century and it is located just close to the Osoblaha town square. 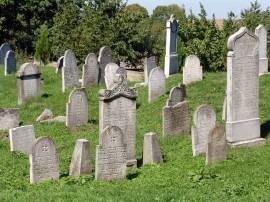 313 tombstones have been preserved in the cemetery. The oldest one comes from 1694. 313 preserved tombstones are made mainly of the white marble, the others are made of sandstone and granite. The tombstones in Osoblaha are typical of their shape and decorations. In 1570 the first wooden Synagogue was built in Osoblaha. In 1624 it was burnt down by Danish soldiers and between 1727-28 it was built again in a baroque style. Unfortunatelly the Synagogue burnt down again in 1802. Between 1807 and 1808 another Synagogue was built, later damaged by a fire in 1833. After reconstruction, the Synagogue was operating till the beginning of the 20th century. In 1933 it was completely destroyed. At present time, some garders are found at its place. In 1865 Jews made 30% of the town population. 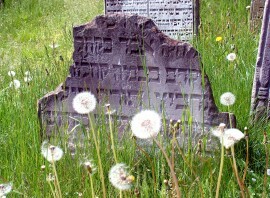 Within the previous regime, in Moravskoslezský county a few Jewish cemeteries, such as in Ostrava, Budišov nad Budišovkou etc., were destroyed. As if by magic the cemetery in Osoblaha is preserved. Till 1989 he cemetery was quite overgrown and affected by ivy and other woody plants. A complete reconstruction of the Jewish cemetery took place at the beginning of the 90´s with a support of the town council. Nowadays the cemetery is the boast of Osoblaha region. After the Jews expulsion from Vienna in 1670, Osoblaha became a harbour of Mešulam Žalman called “the son of Izak Marburg of Vienna”, who died in a Jewish month Adar in 5454 ( March 12, 1694). 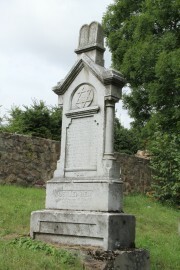 His tombstone is the oldest one in Osoblaha cemetery. On the tombstone there is a notice saying “Here died one of the Vienna exile”. The Union of Jewish communities in the Czech Republic. 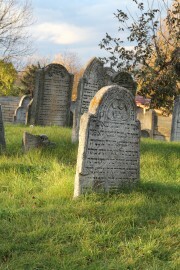 You can visit the Jewish cemetery all-year-long. The admission is free off charge.